I was back on my bike and back on the road – but it was a different bike and a very different road. I was astride my Triumph Tiger 800, its silky smooth triple making the Tenere’s big single feel like a tractor, and ahead lay 200 miles of six-lane tarmac. Lancashire was my destination, the M5 and M6 my route. It wasn’t exactly the Cordillera Blanca, but nevertheless it was good to be back on the move. For a while now, I’ve had CCM’s new GP450 Adventure in my sights as a potential lightweight successor to the Tenere. I’ve read a lot about it, but it was now time to see the real thing for myself. Austin Clews, the boss of CCM, had kindly agreed to let me take a pre-production test bike for two days. 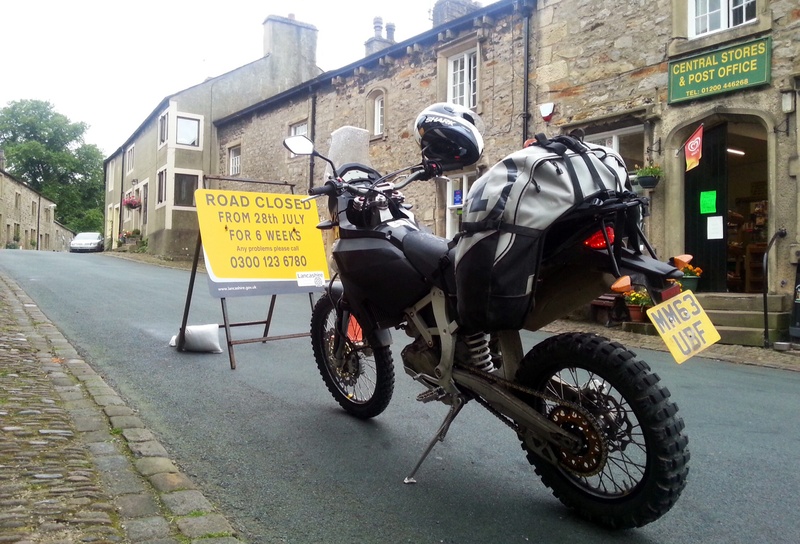 The plan saw me leaving my Tiger at their factory and undertaking a tour of Lancashire and West Yorkshire, racking up some miles whilst visiting Adventure Spec in Hebden Bridge and James Owens in Lancaster – formerly of Adventure Biker Rider and now editing his own on-line magazine, Motorcycle Explorer Magazine. First stop, having picked up the CCM, was Dave Lomax at Adventure Spec. 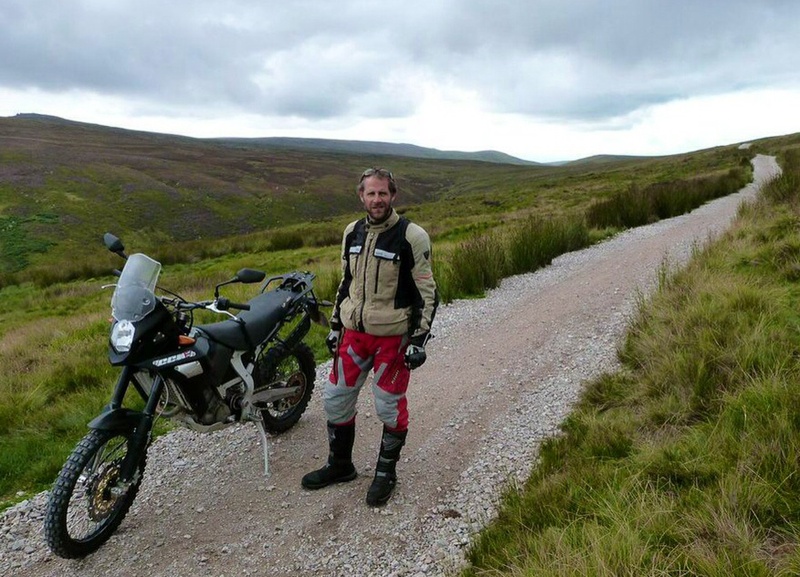 I’ve bought the majority of my kit from Adventure Spec, but hadn’t met Dave – despite speaking to him for hours over the last two years whilst seeking his advice on tank bags, Barkbuster mounts, clothes, tools et al. 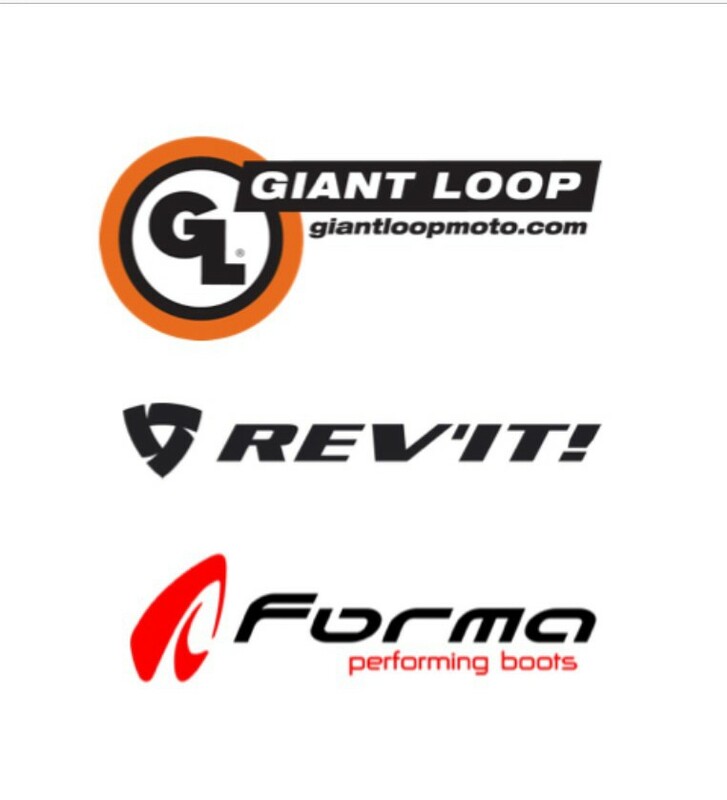 He had agreed to let me test some Giant Loop gear on the GP450, in case I decide to swap my Tenere for one whilst still in South America. What had been planned to be a 30 minute chat turned into nearly three hours, as we talked bikes, travel, video making and even the history of Lancashire’s rural mills and canal system. To balance the itinerant lifestyle of a service family (my father was an officer in the RAF), I spent my teenage years at a boarding school on the side of a north Lancashire fell. I hadn’t been back since I left in 1989. With the next leg of my journey heading north-west towards Lancaster, the old alma mater was literally just off the route. I had to visit. Driving through the woods to the top of the half-mile long avenue in front of the school, I could feel the nerves gripping my stomach as I approached. Then all of a sudden, the small world within which I grew from a child into a young man, where I lived for five years seven days a week, which was more a home for me than anywhere else I lived before or since, was in front of me. I had to stop the bike, turn off the engine and steady myself. That moment was powerful, emotional and somewhat surreal. As I drove past the school gate and ‘private property’ sign, I felt half trespasser and half home-comer. Pulling up at the front entrance, it didn’t cross my mind for one minute that the presence of a lone biker arriving unannounced late in the evening would be challenged. Despite the passage of 25 years, and despite the fact that I share the status of ‘former student’ with tens of thousands of other people, I nevertheless felt that I had an implicit right to be there. Whilst it may sound a cliche, I had a deep-seated sense of coming home. I was met by Pablo the porter, who had been at the school when I was there. After sharing stories and catching up on a quarter century’s gossip, I set off up the fell as the sun was setting to find a quiet spot to pitch my tent. The following morning I returned and was taken round the school for two hours. At every turn, memories were constantly being sparked by sights and particularly smells. It was simply impossible to calibrate to the 25 year absence; there were moments, when I was caught off guard, when I felt that I was still a pupil there. It was a very, very disorientating experience, where my perception of time – which is arguably the backbone of the human experience – was completely distorted. I could have (and wanted to) stay for hours; indeed leaving and riding away from this place felt very unnatural. But James was waiting for me. The Lancashire rain I knew all too well as a boy was back as I rode up M6, and as I pulled up outside James’ house our planned ride out seemed in doubt. But fortunately it passed and we enjoyed a couple of hours exploring a green-lane across the Forest of Bowland. James took me through the the inaugural edition of Motorcycle Explorer Magazine. The digital media debate is an interesting one. I maintain that the digital world and the physical world are fundamentally different experiences and we humans need – at our core – to remain anchored in the physical. Tangible ‘stuff’ will always hold a particular quality for us which cannot be fully recreated by the intangible. So for me, printed media will not completely disappear. But the way in which James is presenting an on-line publication has swayed me more towards thinking the future of magazines must rest in the digital domain. It’s not just a PDF version of a print mag, which in itself offers all the convenience of being able to purchase a magazine anywhere in the world, read it on a portable device and carry multiple copies in your pocket. MEM is taking things a step further. It is genuinely multimedia, incorporating video alongside text and photos. And it is interactive, with significant hyperlinking giving the reader a greatly expanded experience. Interested in an advert of a bike or a new helmet? Click on the ad and go straight to the company’s website, or even to a booking page for a test ride. Like a review of a new book? Click the link and go straight to Amazon to order the book. I suspect this digital format will in due course become the blueprint for on-line magazines. So what about the machine that took me on this trip, you may be wondering? I’m going to save that for a separate post. It’s a bike with a lot of potential, and warrants a few extra column inches. So watch this space. Next stop – Central Wales tomorrow and a day with the Yamaha Off Road Experience. After weeks of blue skies and hot sun, the rain has returned just in time to ensure an authentic UK dirt bike weekend – wet and muddy. Always a pleasure mate – great write up and wonderful fun on the trails in the Forest of Bowland. How disappointing!…..saw the letters ‘CCM’ in the intro and you’ve put if off till next time!! Oh well, I’ll just have to wait with baited breath, then! 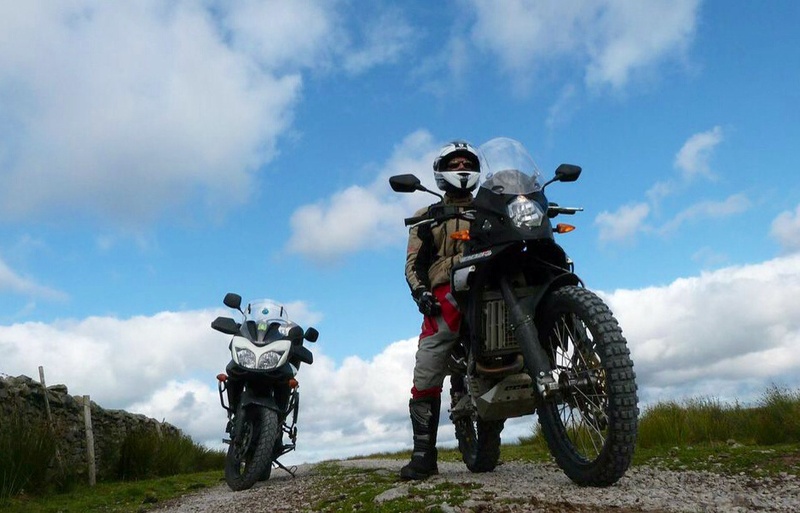 There’s been so much talk about the GP450 by armchair critics it will be great to hear about its pro’s & con’s first hand from a reliable source with solid experience in adventure travel (and a Ten owner to boot). Hi Mark. I better do the write up soon – I’ve just sent a couple of hours on the Triumph Explorer (whilst my Tiger 800 was being serviced) and now I’m off to KTM for a blast on the 1190 Adventure. Chalk and cheese, and entirely gratuitous as I never need or can afford one, but it puts a smile on my face! I guess the Explorer & 1190 are marvellous bikes – if you want a jaunt down to the S. of France on the autoroutes with luggage and pillion! The spec. for the GP450 looks good on paper – I’ve not see it yet in the flesh – albeit the 17 litre fuel capacity is rather low, plus the quoted mpg is not too great. The main point of interest has to be the bonded frame – I wonder how or if it could be repaired in the sort of places you’ve been riding? Or maybe it’s so robust it’s unlikely break or bend except in a write-off situation? At least with bikes like the Ten a basic weld repair can be done almost anywhere which must be a quite important factor. I really hope the CCM succeeds in what it’s intended for albeit I suspect it will be a niche of a niche market (which I must confess I would love to occupy!). Hi Paul! Where are you now? Are you going to cross Colombia? Hi Manuel. Sadly I won’t be coming north from Peru for a while – Paulina has run out of money!! We will probably be in Peru for a few months next year. Not sure after that, but still hoping to reach Colombia eventually!